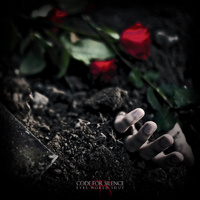 CODE FOR SILENCE is band from Finland which play melodic Death Metal and have been running since 2006. The group consists of seven members and guys playing also in other bands like: STRATOVARIUS, BEYOND THE DREAM, NO SIGN OF LIFE, SOLUTION .45, DARK DAYS AHEAD, SONS OF AEON. The band released a demo titled "Today You Die” back in 2007, full length album, "D.Ecaying M.Atter - O.Rganic N.Emesis” in 2009 and in 2012 their second album "Eyes World Shut”. “Rose Blooms In Bloodred” is a Death Metal grinder with headbanging drumming, aggressive bass, vocals and guitar riffs, yet there is a display of gentle keyboards with an aura of fear as an additional flavor for this track's chorus. CODE FOR SILENCE mixed elements of electronic & industrial on “Flashbacking One Night Stand” along with chug guitar riffs and a great bass work. The chorus is quite nice showcasing melodic singing blended with low end growls kind of in the vein of MY DARKEST DAYS meets SLIPKNOT. I liked “Death Bringer” debating with a fantastic intro of symphonic orchestra, continues with a true Metal riffing mangled by melodic singing and backing growls. The chorus is utterly strong and heavily catchy. I can say that same for “Eye For an Eye", which seemed a tad more aggressive. Worth to listen is “Deathrace” with a nice chorus edged by a cool orchestration. “Neo-Synchronized Capone Dance” is another fine demonstration of symphonic Death Metal conveying a few Black Metal elements with industrial flicks. Awkward, but interesting, track is “The Art of Being a Coward” inflaming with various of music styles along with Death Metal like, Nu Metal, Jazz, Emocore and even Power Metal. “Brothers” is a sort of an epic, a bit fainter, like a ballad added with a saxophone and an acoustic guitar. There is plenty of clean vocal action with only bits of growls and screamos. I sensed a few progressed Death Metal riffs along the way. “On the Streets of a Sleeping City” is another form of multiplicity with technical drum and bass, drums & bass, violins and saxophone. A fine contrast of clean vocal sung verse versus a growled chorus, a true Death Metal ballad. In my opinion CODE FOR SILENCE is good band and their album proved a fine measure of skill. Their advantage is their diversity, therefore their next attempt will surely gather attention.